Bet Eagles -3 over Vikings with 888Sport. Bet Eagles-Vikings over 44.5 points with 888Sport. Bet 2nd quarter as highest scoring quarter at +188 with 888Sport. The Eagles (2-2) come home to Lincoln Financial Field humbled by their 26-23 overtime loss to the Titans. They were up 17-3 midway through the third before imploding on pass defense and eventually allowing a game-losing touchdown catch in overtime to Corey Davis. Pass defense and pass protection are the Eagles’ primary concerns. The secondary has fallen apart, especially on the road, and Carson Wentz took 11 hits and was sacked four times by a Titans defensive front that surprisingly overwhelmed an Eagles offensive line with several Pro Bowlers. It’s been a rough first quarter for the defending Super Bowl champs. Injuries, especially at receiver and running back, have taken some potency away from their offense. Blown coverages and personnel changes have made them vulnerable to the deep ball. Another team embarrassed by some recent losses, the Vikings (1-3-1) are trying to pick up the pieces from a 38-31 defeat to the Rams last Thursday night that rendered them winless in their past three games. The stench of their 27-6 home loss to the Bills four days earlier is still palpable. Head coach Mike Zimmer has questioned the collapse of his team’s defense. The Vikings rank 21st and 22nd, respectively, in yards allowed and points allowed after finishing No. 1 in both categories last year. Kirk Cousins is off to a great start, averaging 347 passing yards per game and with a 103.6 passer rating, but he’s been sacked 13 times and the Vikings’ ground game is dormant. They rank last in rushing yards, rushing attempts and rushing touchdowns. They’re third-worst in yards per carry. Safety Rodney McLeod (knee) going on injured reserve last week hit the Eagles where it hurts most. Corey Graham, who normally plays exclusively in dime, played 71 snaps against the Titans – way too much playing time for a 33-year-old defensive back. Rookie corner Avonte Maddox took Graham’s spot in dime despite no safety experience. The team said Maddox will continue in that role but Graham will have snaps scaled back. On offense, the Eagles have yet to play this season with their top three running backs all healthy. Jay Ajayi is playing through a back fracture, although he ran hard and productively against the Titans. Corey Clement (quad) and Darren Sproles (hamstring) each sat out against Tennessee but are close to returning. Some of Doug Pederson’s signature run schemes have been scaled back because of these injuries, especially the outside zone that capitalizes on Ajayi’s and Clement’s quickness to the perimeter. The Vikings are banged up on the offensive line, which explains their stagnant running game and why Cousins is under constant duress. They’re on a backup left guard and have been hampered by injuries at center and both offensive tackle spots. Running back Dalvin Cook has also battled a hamstring injury that forced him to miss the Bills game and limited his practice leading up to the Rams game, in which he totaled just 20 rushing yards on 10 carries. The mental-health situation surrounding three-time Pro Bowl defensive end Everson Griffen has taken away their best pass rusher until Week 6 at the earliest. Rare is an Eagles home game when they don’t win, and don’t win by double digits. 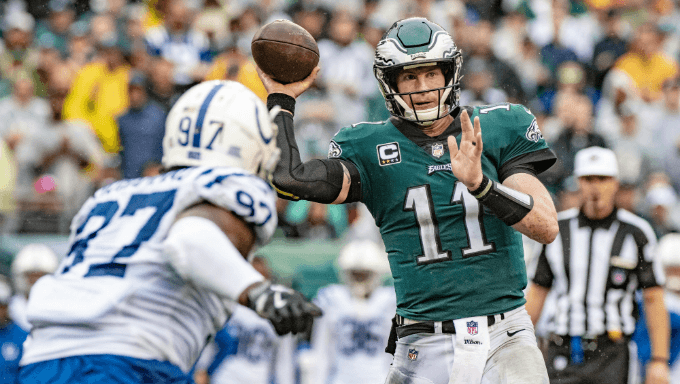 They’re already 2-0 at the Linc this year after going 7-1 at home last year, with their only loss coming in the season finale and the starters resting. With Wentz leading the huddle, the Eagles won all six home games that he started – and won by an average of 19.8 points. This year, they’ve won at home by an average of 5 points, which isn’t much but would still be enough to cover the -3 line against a struggling Vikings team hasn’t seemingly recovered from the 34-point blowout it suffered to the Eagles in last year’s the NFC Championship. Bet the Eagles -3 over Vikings with 888Sport. This game doesn’t have the look of a defensive battle, not with both teams struggling to defend the pass and both coming in with quarterbacks in a good rhythm. Despite all their offensive line woes, the Vikings have scored at least 24 points in three of their four games and are averaging 30 points per game in their two road games – 29 against the Packers at Lambeau Field and 31 against the Rams last Thursday in Los Angeles. Cousins has typically performed well against the Eagles, even when playing for mediocre or bad Redskins teams. In seven career games against the Eagles, Cousins has completed 64 percent of his passes and registered a passer rating of 99.7. His teams have scored at least 24 points in five of those seven games and at least 27 in four of them. The Eagles have racked up plenty of yards in two games since Wentz returned, with 379 against the Colts followed by 432 against the Titans. They’ve just struggled in the red zone, an area of strength last year. Look for the Eagles to improve in this area with improved health. Alshon Jeffery came back against the Titans and went for 105 yards. Ajayi averaged 4.7 yards per carry against the Titans. There’s a lot offensive firepower on the field between both teams. Take over 44.5 points with 888Sport. It’s hard not to notice the second-quarter scoring trend for both teams. The Eagles have scored 23 points in the second quarter this year, as opposed to 7 in the first quarter. The Eagles have started slow and eventually found their rhythm after the first 15 minutes. Meanwhile, Vikings opponents have profited in the second quarter. The Vikings have allowed 44 second-quarter points, by far the most of any quarter. They’ve allowed 31 in the first quarter, 23 in the third and just 12 in the fourth. Teams get up early on the Vikings. Bet second quarter as highest scoring quarter at +188 with 888Sport.